Even though all six scripts were done when artist Marshall Rogers unexpectedly died, and everyone from concerned emailers to the New York Times was asking that we go ahead with another artist as a tribute to Marshall, DC decided to close it down. For all of you who've asked why there were 30 years between "definitive Batmans", and now, why there will never be another, see here. 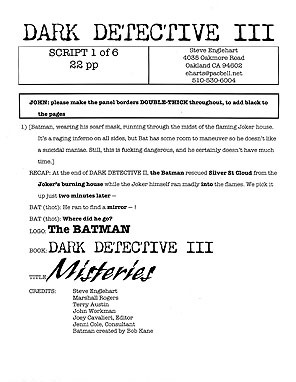 That said, the third installment of DARK DETECTIVE continues the groundbreaking exploration of the man who swore to wear the cape and cowl. Picking up from the end of DDII, the Batman finally realizes that he can never love Silver St. Cloud. Then, his ancient nemesis, Dala the vampire, begs him to put her out of her misery, even though it was destroying her in his earliest days that led him to swear never to kill again. And so we see what happens to a hero when what's good and right and proper, for him and for humanity, runs up against his inflexible code of conduct. He expects to divert himself from these conundra by plunging into a mysterious plot in London, involving Killer Moth, Deadshot, and an unknown mastermind, but finds that (to coin a phrase) no matter where you go, there you are. The vampire and the great love of his life will not leave him alone. As it turned out, this run and its predecessor, DARK DETECTIVE II, became the basis for The Dark Knight film, and a bit of The Dark Knight Rises, which came as a complete surprise to me. 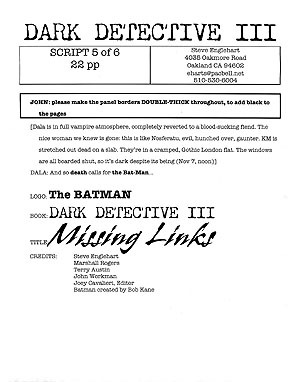 I read all six of your "Dark Detective 3" scripts/pdfs back to back; it was like the proverbial book one can't put down. I really admire the way you continue to explore new ground with these characters. 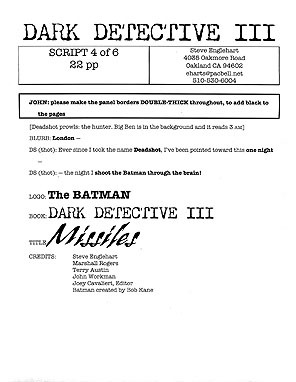 DD 3 is like a hall of mirrors, with Batman confronting distorted reflections of himself. Deadshot initially tried to be a Batman-like crimefighter, and Killer Moth sought to be Batman's criminal counterpart. And Dala the vampiress seems like the embodiment of Batman's own conflicted feelings towards women in the wake of his breakup with Silver. I very much liked the theme of reason versus passion, with Batman using his commitment to reason, represented by his crimefighting mission, to try to suppress his feelings for Silver, and even to convince himself he is incapable of love. 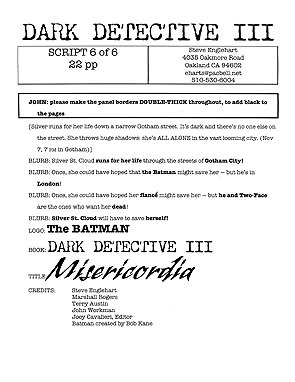 And then there are the grace notes that other Batman writers never do. Of course Bruce Wayne knows nothing about movies; when would he ever go? And for once the villain leaves clues that are actually hard to solve! 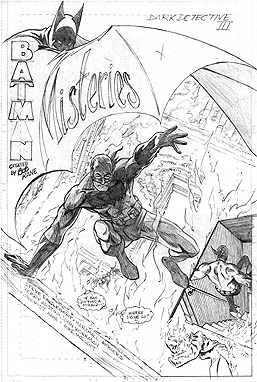 Marshall had drawn most of issue #1 at the time of his death. He never knew they'd adapted us again. 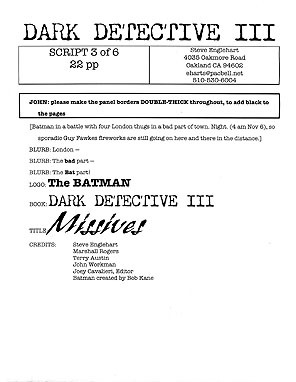 Yes, the scripts are available for sale. No, the art is not - at least from me. Visit his agent, Spencer Beck, for all your Marshall Rogers needs.